Labra is a mixed vegetable recipe. You can use your choice vegetables for labra. 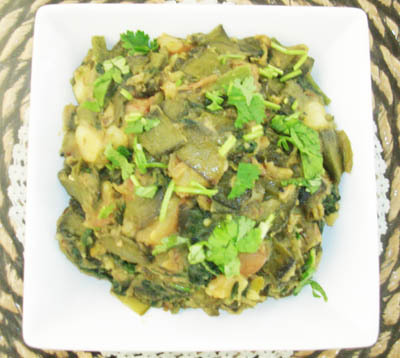 I am using flat bean (sim), bottle gourd leaves(lau shakh) and potato because my mother normally uses these vegetables. Here I will use pach foron, if anyone does nt want to use pach foron, you can just omit that or use cumin/black cumin. 1. 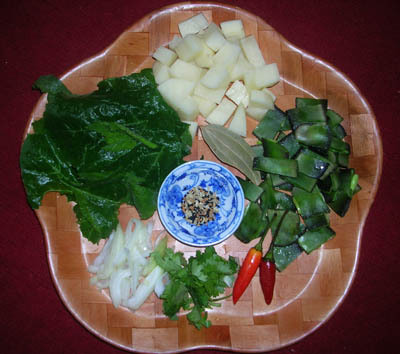 First cut flat beans, gourd leaves and potato into small bite size pieces, wash them and keep the aside separately. 2. Heat the pan on medium high and add oil. When oil is ready add pach foron and bay leaves. 3. When pach foron crackles, add onion. Fry the onion till it become soft and add garlic and turmeric. 4. After 1 minute more add chillies,beans and potato. Cook them 3 minutes and add 1 and ½ cups of water and salt. Cover with lid and give 5 minutes. 5. Add gourd leaves and stir them. Cover it again. 6. Cook till all vegetables are done and add sugar. Stir well. 7. Turn off the heat. Garnish with coriander leaves. 8. Serve labra with hot rice or roti. The labra tested awesome…”labra” the name sounds bit weird though. Good stuff! trying this today. thanx for the recipe. i love any veg one. so does my wife. keep posting more bhabi. thanks bhai. vege is my favorite too.